Todd Plant ~ Vocals & Gutar - J Todd Plant is a Tampa native (Plant High), US Navy Seabees (Honorably discharged)  35+ yrs. performing vocalist and recording artist, appearing on dozens of CDs released worldwide both as featured vocalist and on backing vocals, as well as many commercial jingles.  Performed at Londons Astoria Theatre (appearing on MTV Europe) and recorded 2 CDs with original band Eyewitness.  Toured Europe and recorded 3 CDs with melodic rock band Millenium.  Worked with former members of the Doobie Brothers, Steely Dan, Chicago, Firefall, Blue Oyster Cult, Rick Derringer, Judas Priest & former Jimi Hendrix drummer Buddy Miles. Sang Hulk Hogans theme song American Made heard by millions worldwide.  Performed solo many times at Tropicana Field for Tampa Bay Rays pre-game shows, and at Ruth Eckerd Hall as pre-show entertainment for Ringo Starr and Robert Plant concerts.  Sings with Feeling Good (Michael Bublé tribute), China Grove (Doobie Brothers tribute band), Supernatural (Santana tribute band), and Bob Macars Southtown Fever (corporate/wedding band),  Recorded 4 CDs with progressive rock band Cryptic Vision, opening for legends like Kansas, Asia, Toto, and Swedish proggers the Flower Kings. CHARLIE SOUZA ~ Bass & Vocals - Has toured and recorded with the New Rascals, featuring Rock and Roll Hall of Fame's Dino Danelli & Gene Cornish with Bill Pascali of Vanilla Fudge and was influenced by most artists he has worked with, including Tom Petty, Gregg Allman, Cactus, White Witch and The Tropics. 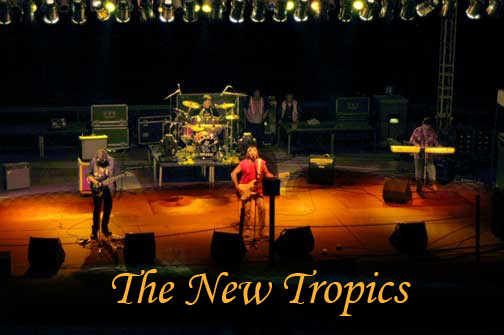 Souza has also recorded with drummer Bill Lordan, formerly of Robin Trower and Sly & The Family Stone, saxophonist Adrian Tapia of Boz Scaggs, and original Tropics guitarist Eric Turner of Atlantic Records Melodic Metal Group Fortress. Charlie released his solo albums "Live Your Dream and "9 Ball in the Corner Pocket" on Souzaphone Records and has written and recorded the official winning city song of St. Petersburg, Florida, "Carry me Back to St. Petersburg" and "Make it Right (In the Gulf of Mexico)", a tribute to the victims of the BP oil disaster in the Gulf of Mexico. Souza is the author of a Rock 'n' Roll Autobiography, Live Your Dream. Mike Conway ~ Drums & Vocals - Originally from Flint, Michigan, Mike did some television work with Frank Casey in Flint. He also plays bass, trumpet, trombone, guitar, tuba and Souzaphone, (the instrument invented by Charlie's great, great..) Mike's Band "TKO" enjoyed great success up and down the eastern seaboard and in the Midwest with airplay and tour support following the release of the album "On the Mat," featuring the hit single "Karen". Mike now plays on recordings for artists from around the world, and is also a writer. His work, both creative and musical, is used everyday by companies around the world for advertising, in training films, TV productions and films, as well as playing on hundreds of recordings for countless artists in development and well known recording artists, live on stage and in the recording studio. Some References include: Nicolette Larson, Nancy Wilson, Tone Loc, Neil Larsen, Richy Kicklighter & Bertie Higgins. Jaybo Key ~ Guitar & Vocals - Jeffrey Charles "Jaybo" Key has played with Bruce Springsteen, Atlantic recording artist Rochelle D, Toy Caldwell, The Crests, Mercy, The Dovells and members of Todd Rundgren's Utopia & Blue Oyster Cult and has been entertaining professionally for over 30 years. Jaybo Key is a dynamic, highly skilled and talented musician's musician and entertainer with professional qualifications as a guitarist, keyboardist, songwriter and vocalist, a creative, artistic, self motivated teaching professional with a solid reputation for effectively providing instruction on any musical subject to people of all ages! Jaybo is in the same family tree as The Star Spangled Banner's composer, Francis Scott Key.